Elephants in the Chobe National Park in Botswana. Eighty-seven elephant carcasses were found in the country, months after it disarmed its anti-poaching unit. "I'm shocked, I'm completely astounded," Mike Chase of Elephants Without Borders told the BBC. "The scale of elephant poaching is by far the largest I've seen or read about anywhere in Africa to date." Many of the elephants were killed within the last few weeks and three white rhinos in the same area were poached and killed within the last three months, according to an Elephant Poaching Incident Report Reference written by Chase and obtained by NPR. "All carcasses [were] presumed to be poached, because all of them had their skulls chopped to remove their tusks," writes Chase. "Poachers tried to hide their crimes by concealing the mounds of rotting flesh with drying bushes." "The varying classification and age of carcasses is indicative of a poaching frenzy which has been ongoing in the same area for a long time," the report says. 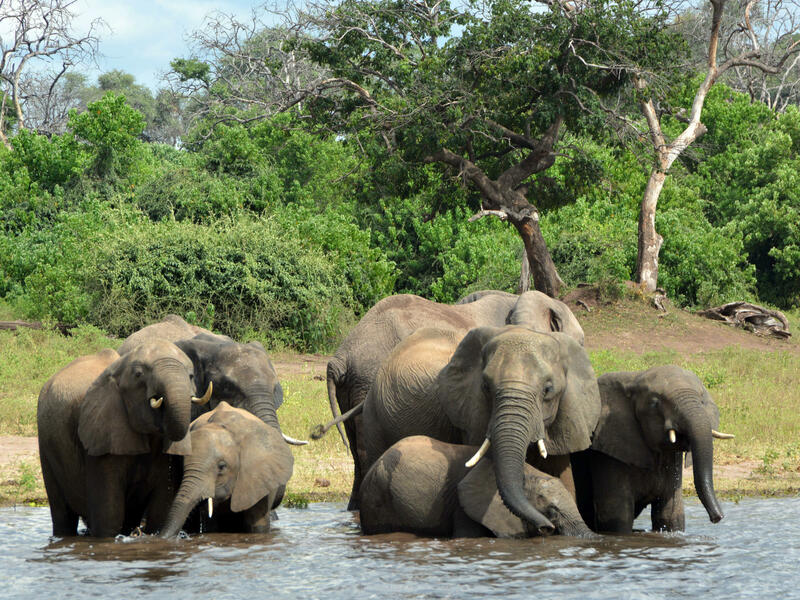 Botswana is home to the largest elephant population in the world, according to the Great Elephant Census, a report conducted by Elephants Without Borders and the Paul G. Allen Family Foundation. The country holds 37 percent of its continent's endangered elephant population. Elephant populations in Africa declined by 30 percent — around 144,000 elephants — from 2007 to 2014. The same report says 84 percent of all elephants in the continent were sighted in legally protected areas, like the ones the 87 elephants were poached in. The carcasses were found near the Okavango Delta wildlife sanctuary, a biodiverse international tourist destination of over 22,000 square kilometers. Botswana disarmed its anti-poaching unit in May, one month after President Mokgweetsi Masisi took office. The country previously had a shoot-to-kill policy against poachers. The BBC reports a "senior official in the president's office, Carter Morupisi, told journalists in Botswana at the time that the 'government has decided to withdraw military weapons and equipment from the Department of Wildlife and National Parks', but he did not explain why." Large-scale poaching was rare before the policy was rescinded, reports the BBC. "The poachers are now turning their guns to Botswana. We have the world's largest elephant population, and it's open season for poachers," Chase told the BBC.